Sensei John "Moose" Axsom is the personal student of Kyoshi CD Williamson (Hachidan-8th Degree Black Belt, 40 years training and teaching experience and former Kick-boxer) of Niceville, Florida. Sensei Moose, as Kyoshi Williamson nicknamed him at age 9, has over 14 years of karate teaching experience and over 18 years of training experience. Sensei Moose and his teacher travel to Okinawa regularly--at least once a year for personal training with Hanshi Shugoro Nakazato (Judan-10th Degree Black Belt and President and Founder of the Okinawa Shorin-ryu Karate-do Association). Sensei Nakazato is Chosin Chibana Sensei's personal student. Chibana Sensei is the founder of Shorin-ryu Karate in Okinawa--Chibana Sensei turned over control to Nakazato Sensei upon his death. Sensei Moose as a young man has competed in numerous tournaments, knock down fights and point matches. Likewise, Sensei Moose is a 4 year teacher with Newport News Public Schools--teaching now at Menchville High School as a 12th grade Government and 11th Grade US History student. Sensei Moose began training in traditional karate in 1992—it was his 10th birthday gift. Under the tutelage of Kyoshi CD Williamson, Sensei Moose developed a strong counter fighting style of jiyu Kumite (free sparring). In 1997 & 1998, Sensei Moose won 1st place in the black belt division at Louis Clay’s Petersburg Open—still the largest open tournament in Virginia. IN 1996, Sensei Moose accompanied his teacher to the Olympic Games in Atlanta, Georgia. The Shorinkan, under the direction of Hanshi Shugoro Nakazato (Judan-10th dan) had been asked by the Olympic committee to put on a demonstration. Over three hundred people were a part of a weekend long training/demo in honor of the Olympics. In 1998, Sensei moose fought at the Battle of the Beach winning all three matches—in his third fight, his opponent gave up due to intense body shots. 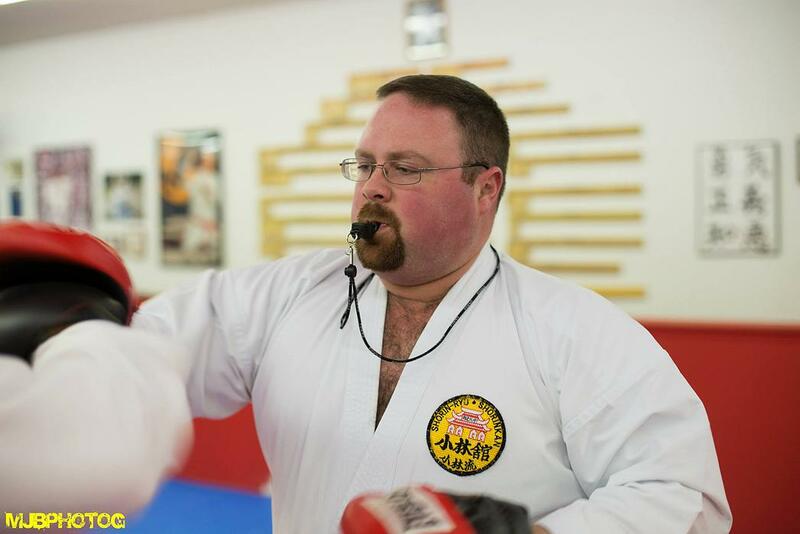 Sensei Moose, though he teaches point sparring, now specifically focuses on iri Okinawan style Kumite, that is about power, determination and speed—holding your own and delivering controlled, hard hitting blows to one’s opponent. In 2006, Sensei Moose traveled to Okinawa to train at the Hombu Dojo (Sensei Nakazato’s Association Headquarters) with Sensei Nakazato and his high ranking Kudans, Hachidans, and Nanadans (All 9th, 8th, and 7th degree black-belts). Since 2006, Sensei has returned four additional times to Okinawa and Japan for training. Kata, Kumite, and Kobudo are the things that Sensei Moose teaches to his deshi (students). Come learn the old style of shuri-te that is now Shorin-ryu, and get a true taste of traditional karate-do at the Oushi-Musu No Yakata! 1997-Shodan (1st Degree Black Belt) Shorin-ryu Karate DO 1998-Nidan (2nd Degree Black Belt) Shorin-ryu Karate-Do and Shodan (1st Degree Black Belt) Okinawan Kobudo 2006-Sandan (3rd Degree Black Belt) Shorin-ryu Karate-Do and NIdan (2nd Degree Black Belt) Okinawan Kobudo 2008-Sandan (3rd Degree Black Belt) Okinawa Kobudo 2009-Yondan (4th Degree Black Belt) Shorin-ryu Karate-do 2010-Yondan (4th Degree Black Belt) Okinawa Kobudo 2011-Godan (5th Degree Black Belt) Okinawa Karate BA Political Science and Public Service, Hampden-Sydney College MA, Social Science Education CNU PMCL Educational Leadership and Policy, GWU Educational Background: Karate (Empty Hand) and Kobudo (Weapons): "Our dojo will focus on the karate education of the whole student, or karate-ka, with an emphasis on culture, history, and, of course, training."